Here’s how weekly meal planning often starts for me: I pick up my recipe notebook and a pen and plop myself in front of the fridge, making a detailed list of the soon-to-spoil items I need to use ASAP. In late June, one of those items was a Costco size tub of organic hummus, and how much veggies and hummus dip can one actually eat in a week? By this point in the container, I did not want to look at another pepper or celery stick or cucumber slice dipped in the stuff, so I went to Google for some answers. The plethora of food websites didn’t let me down. Lists upon lists of “15 ideas for hummus,” “12 ways to use leftover hummus,” and the like flooded my screen. One idea, from Bon Appetit (the third on this list), caught my attention because it used up more than a couple tablespoons of hummus spread via a sandwich, and it was simple enough that it didn’t include a recipe in the form we know it–just a quick description of hummus chicken salad without any concrete quantities in sight. Two problems with this. 1) I don’t eat chicken on the reg and 2) most folks, me included, prefer at least some semblance of quantities the first time we make someone else’s recipe. In racking my brain for a meat substitute, I quickly landed on one of my favorite whole, plant-based meat substitutes: lentils! The French green ones that I often champion pose little risk of falling apart and turning into a pile of mush. That would only yield some kind of whipped lentil hummus, which is not the goal here. With these teensy, filling lentils in mind, I set out to solidify a dressing recipe, quantities and all. After a couple test runs, I landed on this final variation, substituting sour cream for Greek yogurt because I like it better and, as a result, tend to have it on hand in the fridge at all times. Okay, so we’re kind of sour cream addicts/spoon-lickers in my house, but that’s beside the point. If you’re the opposite, you can substitute Greek yogurt to your heart’s content. 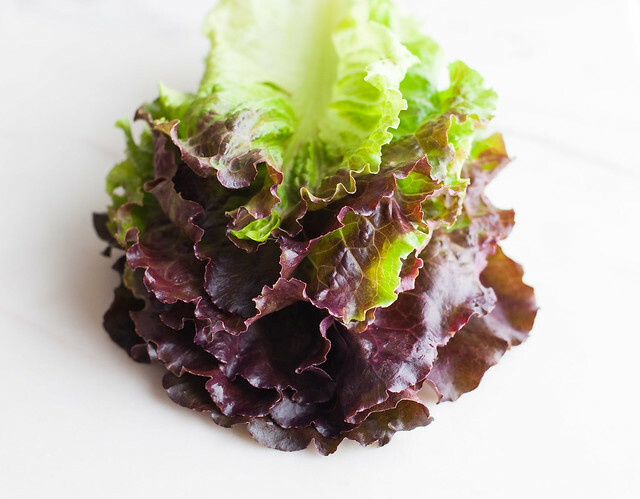 It started out as a humble ingredient-using recipe, but I’ve really come to love this lettuce wrap recipe after it’s made our dinner menu at least three times this summer. It’s light but filling, a textural wonderland, perfect for hot weather, and appealing to vegetarians and omnivores alike. This last time, I nailed it by omitting feta cheese in favor of walnuts. Sure, cheese is great, but it’s kind of unnecessary on top of the equally tangy sour cream (or yogurt). By using walnuts, you up the crunch factor a bit, balance several tangy flavors with that smooth, toasty taste, and, of course, replace an animal-based ingredient with one from plants. Since I hardly ever eat meat, I look to sources like walnuts to get the omega 3’s that food marketing would have us believe comes exclusively from salmon. Nut-ritional win, right? Even though I love putting fun dinner recipes like this on the weekly agenda, we may drop into a little more of a boring, for lack of a better description, food routine in the next few months, as wedding planning builds up to the big day (November 7!). I can almost giggle about it in retrospect, but it’s getting to the point now of disproportionately dramatic incidents over tiny details. Basically, I’m trying to make it sound less childish that I shed a few tears over wedding invitations this week. What?! Not something I could have foreseen, but apparently I’m bigger into stationery than I thought. The whole thing just reassured me (not that I needed it) that I’m about to have the best husband in the world, who instantly came to the rescue with hugs, sympathy, and 17 different possible solutions. We have moved on and forward, but part of the solution is focusing on only the big, important “silos” over the next few months. Cooking an elaborate dinner with 2 to 3 hours of prep every night, even in the name of NCK, is not one of those silos. Coincidentally, this revelation in meal planning aligns with back-to-school season, so I hope the simpler dinner recipes you’ll see here on the blog over the next few months can help you keep up whole foods, healthy eating as we all head into an often busy time of year together. 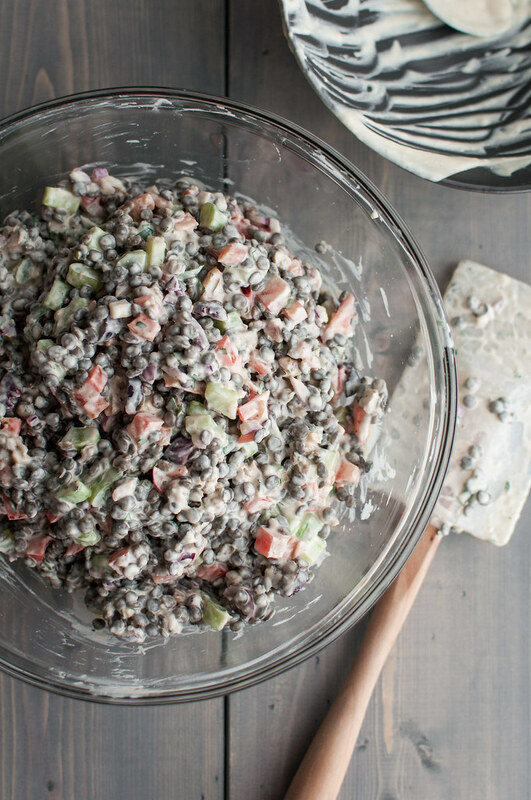 And here’s my favorite fall lentil recipe, mainly because it contains lots of wine. 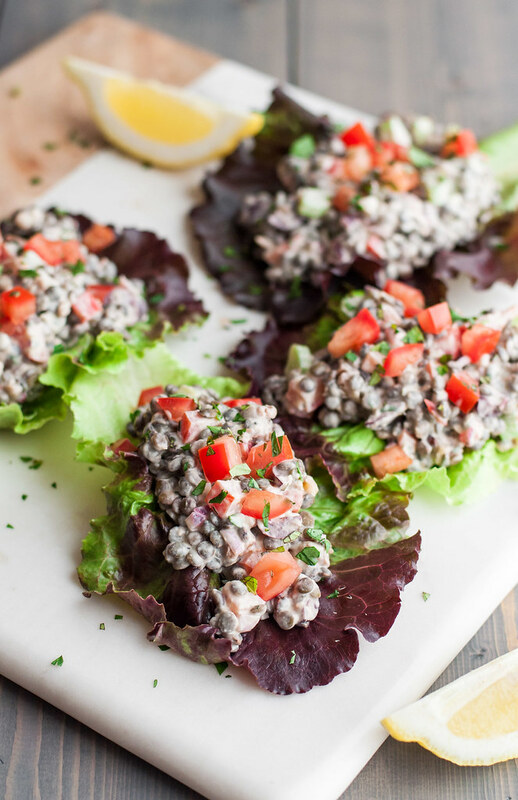 Most of the prep work for these meatless, creamy lettuce wraps can be done while the lentils cook, so no cook time is included in the total time. 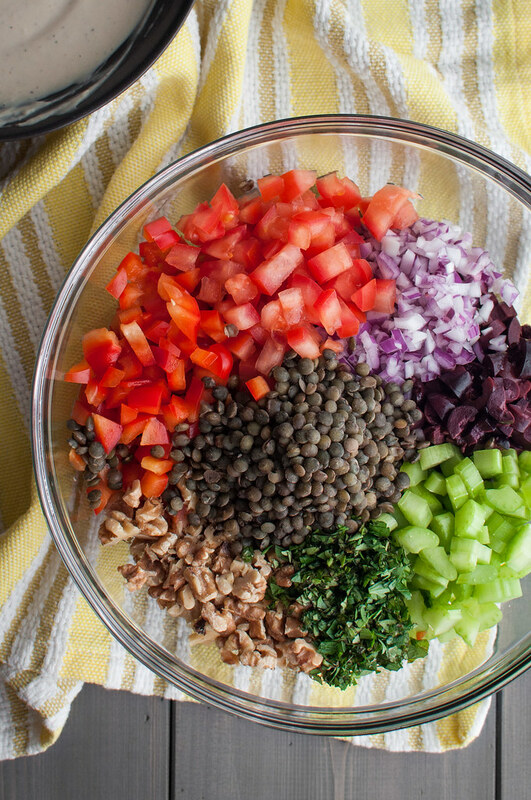 The lentils and dressing can be prepared separately ahead of time, or assemble the whole salad a day ahead. Combine lentils, water, bay leaf, and ½ teaspoon salt in a medium saucepan over high heat. Bring to a boil, then simmer uncovered until lentils are tender but not falling apart, about 20 minutes. Drain, rinse with cold water, and remove the bay leaf. Transfer to a medium mixing bowl and set in the fridge to cool. Prepare other ingredients, up through fresh herbs, if you haven't already. 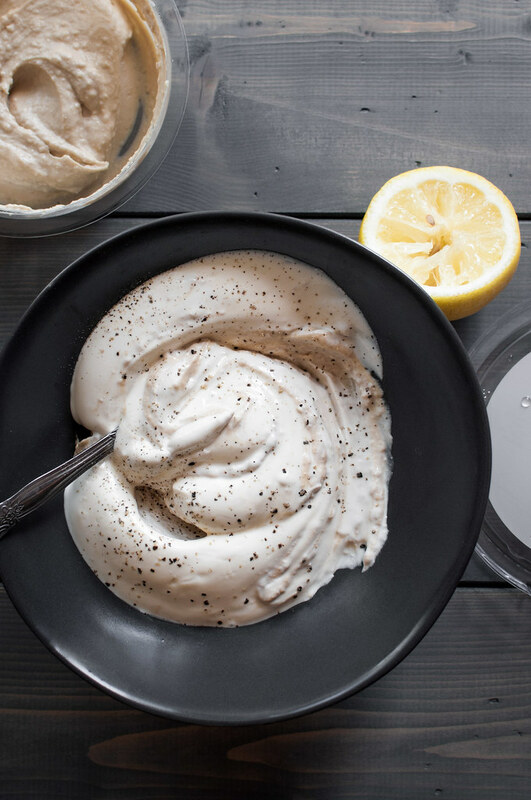 Combine sour cream, hummus, lemon juice, ½ teaspoon salt, and ground black pepper to taste to make the dressing. 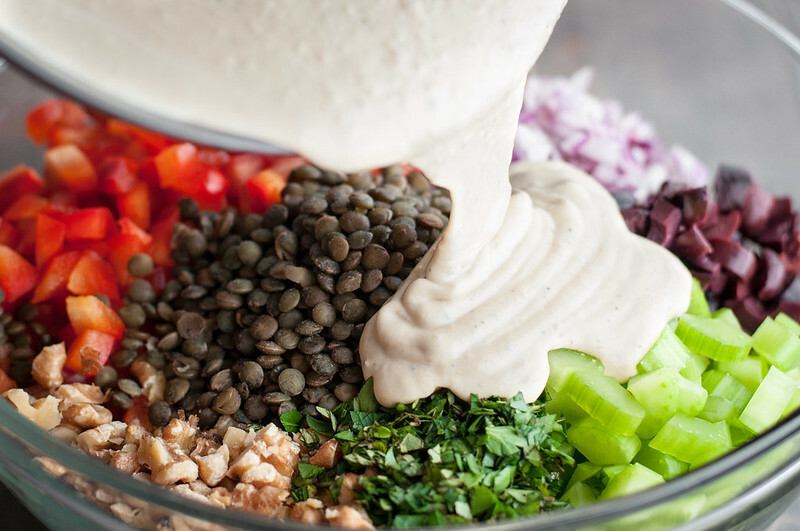 Add the olives, vegetables, nuts, and herbs to the lentils, then pour in the dressing. Stir gently until everything is well mixed and adjust seasoning as needed. 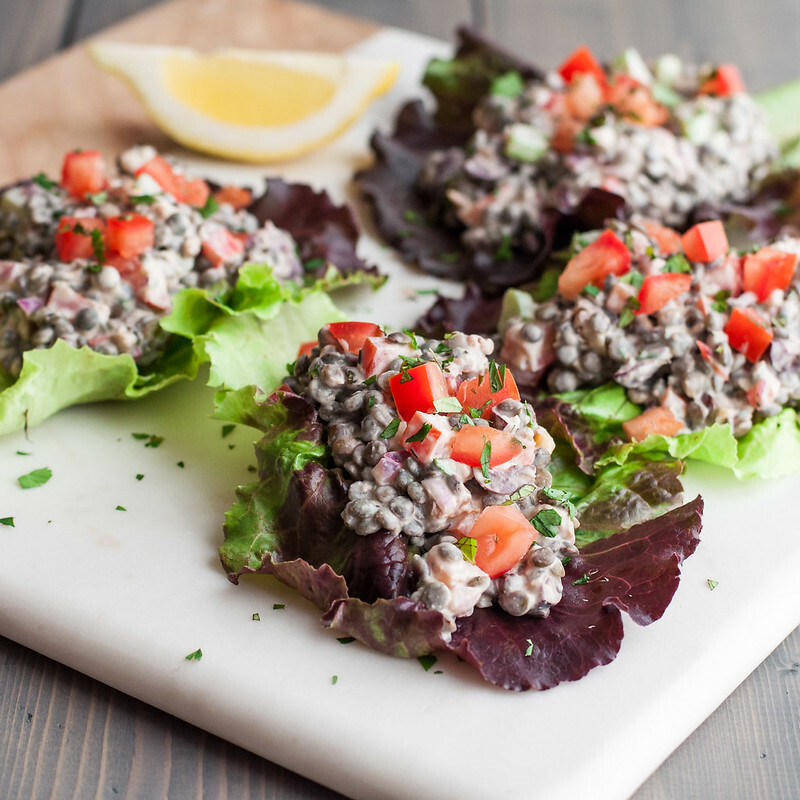 Serve lettuce leaves and lentil salad family style, letting everyone scoop plenty of filling onto each piece of lettuce. If you have any of the salad ingredients leftover, serve as extra toppings. The lentil salad keeps well for a couple days in the fridge--just stir to remedy any separation caused by the water content of the tomatoes. Note: This page contains affiliate links. It does NOT contain sponsored content. 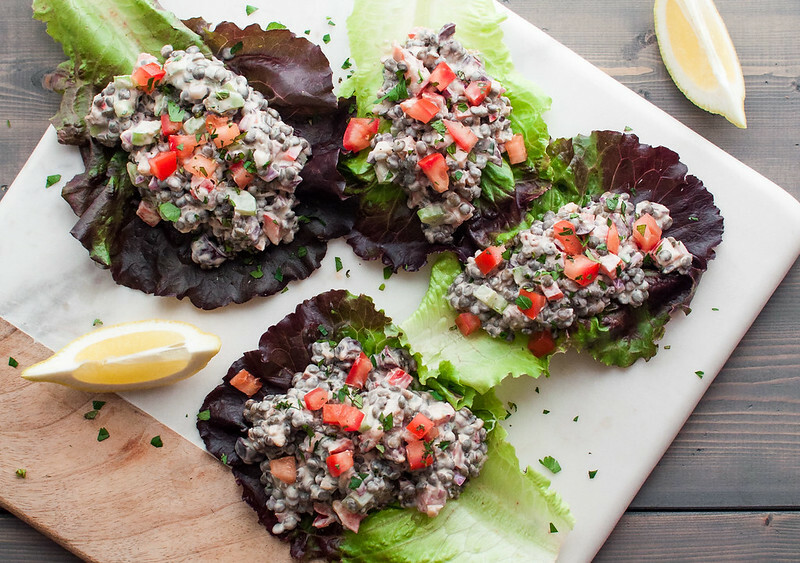 Affiliate links (to products I recommend, on Amazon) offset my ingredient and website maintenance costs, so I can keep bringing you quick and yummy recipes like this one. Thanks! 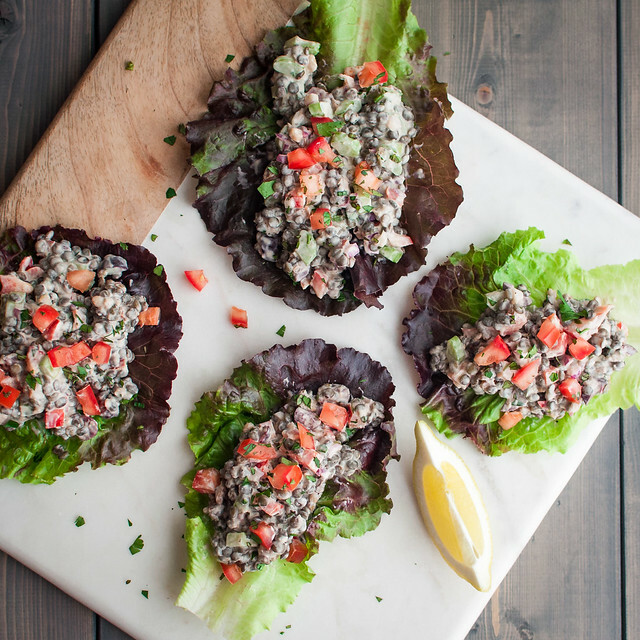 These lettuce wraps look incredible! I love the combo of ingredients!! Wonderful wraps! We managed to plan our wedding in one week, from Thursday to the next Friday. It wasn’t very big or particuarly fancy but it was the best I have ever been to (obviously as it was mine :)) Everybody enjoyed it thoroughly, there are so many little stories that people remember over and over again even after 10 years(one of them is that we totally forgot about the music, so we just had some CD player playing in the background). Don’t stress too much over the arrangements, you don’t want to miss the fun just because you have to worry about the flowers or music or table arrangements. Thanks Adina! That’s exactly what I hope to remember–the memories with family and friends. Trying to focus on that in moments of stress. And wow! One week–you should write a post on how you did it. I think you’d have a lot of jealous brides-to-be!